After months of rumours and anticipation, Nokia 8 is finally official. HMD Global, the company behind Nokia's comeback into the smartphone game, unveiled the Nokia 8 at an event in London today. The smartphone is priced at 599 Euros and comes with an all-metal design, ZEISS optics, OZO audio and top of the line internals. To say that the Nokia 8 is one of the most hotly anticipated smartphones of the year would be an understatement. 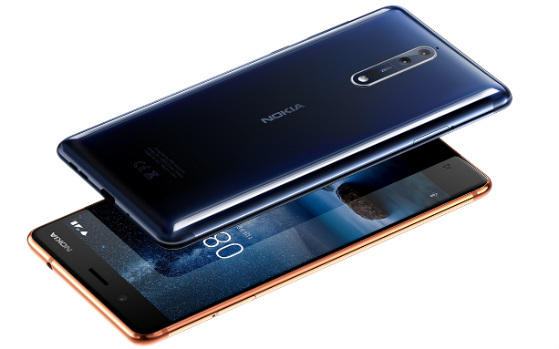 The Nokia 8 is not only Nokia's first flagship smartphone since its Windows Phone days, it is also the first high-end smartphone from the Finnish company to run on Android. The all-metal Nokia 8 is crafted out of a single block of series 6000 aluminum and is just 7.3mm thin. Nokia claims that the smartphone is put through a 40-stage process of machining, anodising and polishing and the gloss effect on a few color variant takes over 30 hours to perfect. The Nokia 8 is powered by the Qualcomm Snapdragon 835 processor paired with 4GB of RAM, the Adreno 540 GPU and a 3090mAh battery with Quick Charge 3.0 support. The smartphone comes with 64GB of internal storage expandable via a microSD card (up to 256GB) and a fingerprint sensor embedded into the home button up front. Additionally, The Nokia 8 comes with a 5.3-inch QuadHD display with 2.5D Gorilla Glass 5 on top for protection against nicks and scratches. The display has a maximum brightness of 700 nits and comes with Nokia's trademark Glance Screen. The smartphone also has a very innovative heat management solution with a full-length graphite shielded copper cooling pipe that dissipates heat across the full length and breadth of the smartphone. Just like the rest of Nokia's Android smartphone line-up, the Nokia 8 runs on a 100 percent stock build of Android. Unlike the Nokia 3 which ships with Android 7.0 out of the box, the Nokia 8 comes with the latest version of Android Nougat - 7.1.1. Nokia has promised that the Nokia 8 will be updated to Android O in the future. The Nokia 8 comes with a 3.5mm headphone jack, which is fast becoming a rarity in today's world. It also comes with support for OZO Audio - thanks to Nokia's acoustic algorithms and the smartphone's three microphones, you can capture 360 degree spatial surround sound. On the imaging front, the smartphone carries forward Nokia's proud association with Carl Zeiss which has given us iconic camera phones like the Nokia N95 and Lumia 1020 in the past. It comes with a ZEISS powered dual camera setup at the rear with a primary 13MP color sensor with optical image stabilisation and a secondary 13MP monochrome sensor. Both sensors have an aperture of f/2.0. Nokia claims that the secondary sensor helps capture depth of field information and improves low-light photography. The rear camera setup comes with phase detection auto focus and a dual-LED flash and supports 4K video recording. On the front, there is a 13MP camera with an aperture of f/2.0 and phase detection autofocus for selfies. The Nokia 8 is the first phone in the world which allows 'Dual-Sight' video to be live streamed natively and in real-time to social feeds such as Facebook. The feature allows you to use the front and rear camera at the same time for both photos and videos. Nokia calls this feature #Bothie. The Nokia 8 has been priced at 599 Euros which roughly translates to around Rs 45,000. It will be available in four colour options - Polished Blue, Polished Copper, Tempered Blue and Steel and will go on sale globally throughout September. While Nokia has not officially announced details regarding the smartphone's Indian launch, it is expected to go on sale in country in the month of September itself. The Nokia 8 is expected to be priced at Rs 39,999 in India in order to compete with the OnePlus 5. Juho Sarvikas, Chief Product Officer of HMD Global, said:"We know that fans are creating and sharing live content more than ever before, with millions of photos and videos shared every minute on social media. People are inspired by the content they consume and are looking for new ways to create their own. It's these people who have inspired us to craft a flagship smartphone which perfectly balances premium design, an outstanding experience and powerful performance." Back in February, HMD Global announced the Nokia 6, Nokia 5 and Nokia 3 along with the 2017 version of the Nokia 3310. The Nokia 5 and Nokia 3 have already gone on sale in India and are available only through offline retail stores. The Nokia 6 on the other hand is available exclusively via Amazon India and is set to go on sale from August 23 onward.